Choose your own dining adventure with our open value certificates for Lunch & Dining restaurant certificates. Select anything from fine dining to casual family style establishments located in Sydney, Melbourne, Perth and more. These packages make a great gift for corporates, family Christmas gifts and anyone who loves to dine. It may be in the middle of Park Road, Milton but La Dolce Vita Ristorante could easily be in the centre of Rome or Venice. This wonderfully atmospheric restaurant has been celebrating 'the sweet life', Italian style, since 1992 with relaxed footpath dining, an authentic menu, and an unmistakably Italian passion for food and coffee. Romain Bapst is one of Brisbane’s most celebrated and loved chefs. His restaurant boasts sweeping views over Brisbane is Bardon's elegant, tres Parisien Lutèce Bistro & Wine Bar. The restaurant offers a menu of French classics, like braised beef cheek and escargot. Like any bistro worth its salt, Lutèce offers a prix fixe menu at lunchtime, which provides excellent value on seasonal dishes. Surprisingly, the wine list is a mixture of French and Australian labels, so there's no snobbery to be had here. Patina at Customs House is home to an awarded restaurant which features heritage surroundings and spectacular views. Guests can enjoy indoor and al fresco dining all year round. 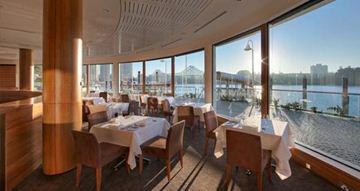 Take a seat within the heritage dining room and marvel at the glamorous surroundings, or reserve a table on the River Terrace overlooking the Brisbane river and Story Bridge. Guests can be assured of excellent food, fantastic river views and friendly, professional service. The wine list has quality wines from local, national and international wineries.